The Gantt Chart is a type of a bar chart used to depict the schedule of a projectProject Finance - A PrimerProject finance primer. Project finance is the financing of long-term infrastructure, industrial projects, and public services, based on a non-recourse or limited recourse financial structure, in which project debt and equity used to finance the project are paid back from the cash flow generated by the project. The chart was developed at the beginning of the 20th century by Henry Gantt, an engineer and management consultant. 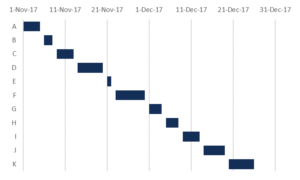 The Gantt Chart is a powerful project management tool that illustrates the start and finish dates of project elementsProject Budget TemplateThis project budget template provides you with a tool to summarize the cost budget for a project. The Project Budget is a tool used by project managers to estimate the total cost of a project. A Project Budget template includes a detailed estimate of all costs that are likely to be incurred before the project is comple, as well as the sequence and dependencies between project elements. The chart provides project managers with the opportunity to manage and monitor resources and tasks in a project, as well as the opportunity to check whether the project remains on the track. To use a Gantt Chart effectively, you must know the key elements of this type of charts. Tasks and sub-tasks are listed on the left side. Dates are located at the top. Milestones are the tasks crucial to a project’s success. Milestones are represented as diamonds on the chart. 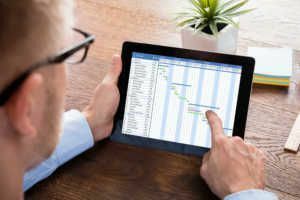 There are many different software applications that can be used to create a Gantt Chart. Many of them are specific project management tools such as Microsoft Project. Microsoft Excel can also be used to develop a Gantt Chart but it is not the best software to do it. There is no specific template in Excel for creating the chart; thus, it is necessary to create the template for the chart from scratch. In this article, we will discuss two methods to create a Gantt Chart in Excel. The first method to create a Gantt Chart in Excel is to use existing chart templates and adjust them for the chart. The table should contain the main information about the project such as a list of tasks to complete a project, start and end dates for each task, and the duration of each task. Select the Start Date range in the table, click Insert -> Column or Bar Chart -> Stacked Bar. a. Right-click on the chart area. d. Select the cell with column’s title for Series Name and select the range of Duration values for Series values. Do not include the title cell into the range for Series values. c. In the pop-up menu, on the right side under Horizontal (Category) Axis Labels, click Edit for the Start Date series. d. Select the tasks names range from the table. a. Right-click on any blue bar in the chart, choose Format Data Series -> Fill & Line -> No Fill. The blue bars will become transparent on the chart. b. Right-click on any task’s name on the chart and choose Format Axis. Then, select Categories in reverse order. It will arrange the tasks names in the right order on the chart. c. Right-click on the first value of Start Date in the table and choose Format cells -> General. You will see the number such as Then, right-click on any date on the chart and choose Format axis and under Axis Options -> Bounds -> Minimum enter the number you saw before. It will remove the white space on the left side of the chart. d. Right-click on any of the bars on the chart and choose Format Data Series. Minimize the percentage of Gap Width to remove the excess space between the bars in the chart. The previous method provides only a simple version of a Gantt Chart. The main drawback of that method is that the user cannot simply modify the data in the chart if there are any changes in the project. However, there is another approach to create a Gantt Chart in Excel to address this problem. List the names of each task, start and end date, duration of each task, and percentage of the work completed. In addition, you can input the tasks ID and names of people responsible for performing each task. 2. Create the dates on the top of the table. a. Choose the start date of the project and enter it in one of the cell. Right-click on that cell and choose Format cells -> Custom and under Type enter Your date will appear only as the day number. b. To enter the next day, in the next cell to the right enter the following formula =I6+1. Instead of I6, enter the cell that contains the original date of your project. 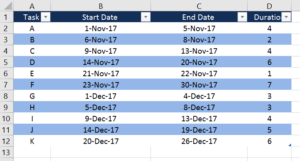 Copy and paste the formula to have range of dates you need. c. You can also insert the day of the week below to make tracking the dates easier. To do so, in the cell below, enter the following formula =TEXT (WEEKDAY(I6,1), ”ddd”). Now your template for the interactive Gantt Chart is ready. 3. Apply conditional formatting to create bars. a. Click Home -> Conditional Formatting -> New Rule -> Use a formula to determine which cells to format. b. Type the following formula =AND ($E9<=I$6, $F9>=I$6). Cells E9 and F9 should correspond to the start and end dates of the first task in your table, while I6 is the first date you entered in the table. c. Click Format -> Fill, choose the color of the fill and press OK.
d. Then go to Conditional Formatting -> Manage Rules -> This worksheet. In the Applies to section, enter the area of the worksheet where the bars of a Gantt Chart should be located. Excel Shortcuts OverviewExcel Shortcuts OverviewExcel shortcuts are an overlooked method of increasing productivity and speed within Excel. Excel shortcuts offer the financial analyst a powerful tool. These shortcuts can perform any functions as simple as navigation within the spreadsheet to filling in formulas, or grouping data.